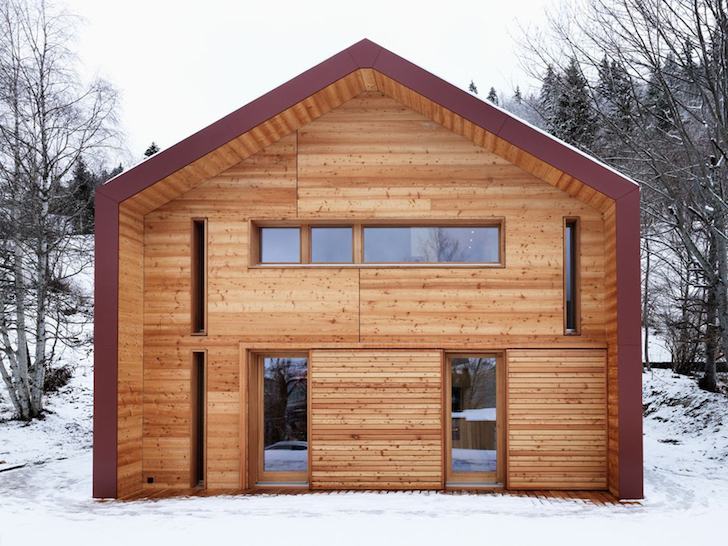 Architecture firm Ralph Germann completed a modern home nestled near a lakeside in the Vallée de Joux, a Swiss valley famous for its unspoiled countryside and bitterly cold winters. The architects protected the home from the region’s harsh winter climate by wrapping the structure in an anthracite metallic shell—a material that alludes to the valley’s industrial identity as the birthplace of Swiss horology. The ribbed metal facade is complemented by generous amounts of larch cladding, which gives the home a cozy feel. Sited on an 8,600-square-foot plot of land, the Vallée de Joux house is located just a few steps from the shores of Lake Joux. The lakeside views and surrounding scenery are framed through rectangular strips of glazing installed in varying lengths and orientations. The minimalist, modern home was built from local environmentally friendly materials that bear the “Minergie” Label. Although similarly sleek and modern in appearance, the interior boasts a cozier aesthetic with its palette of white walls and larch. The minimalist rooms are punctuated by bright pops of color, from the two red lacquered staircases to a forest-green reclining chair. The pair of red staircases leads up to separate sleeping quarters: one side houses the master bedroom, while the other is for guest rooms. Sited on an 8,600-square-foot plot of land, the Vallée de Joux house is located just a few steps from the shores of Lake Joux. The lakeside views and surrounding scenery are framed through rectangular strips of glazing installed in varying lengths and orientations. Although similarly sleek and modern in appearance, the interior boasts a cozier aesthetic with its palette of white walls and larch. The minimalist rooms are punctuated by bright pops of color, from the two red lacquered staircases to a forest-green reclining chair. The minimalist, modern home was built from local environmentally friendly materials that bear the “Minergie” Label. The pair of red staircases leads up to separate sleeping quarters: one side houses the master bedroom, while the other is for guest rooms.